"I never have leftovers when I serve this. You can use low-fat or nonfat sour cream for this recipe if you'd like." Preheat oven to 350 degrees F (175 degrees C). Spray a jellyroll pan with non-stick cooking spray. In a medium-sized mixing bowl, combine sour cream, cream cheese, dill weed, garlic salt and ranch dip mix. Spread this mixture on top of the cooled crust. Arrange the onion, carrot, celery, broccoli, radish, bell pepper and broccoli on top of the creamed mixture. Cover and let chill. Once chilled, cut it into squares and serve. A great way to tastefully get raw veggies into an appetizer! Love this recipe. To serve easier, I cut the crust BEFORE I put on cream cheese mixture. No mess. I also add finely shredded cheddar cheese and press in slightly. Delicious. I added my own combo of veggie ingredients: carrots, sweet onion, cucumber, broccoli, cauliflower, and black olives. 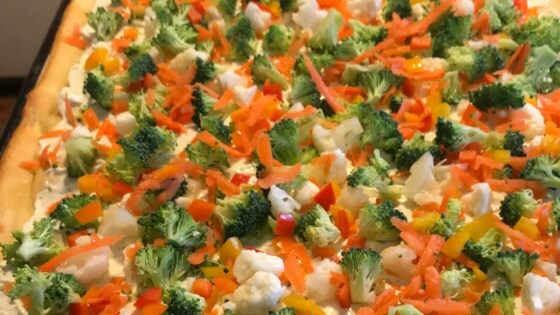 I made this for a large party and had platters full...people loved it-it is not the same old boring appetizer, use colorful veggies and it comes out great! Very quick, very easy, very good.